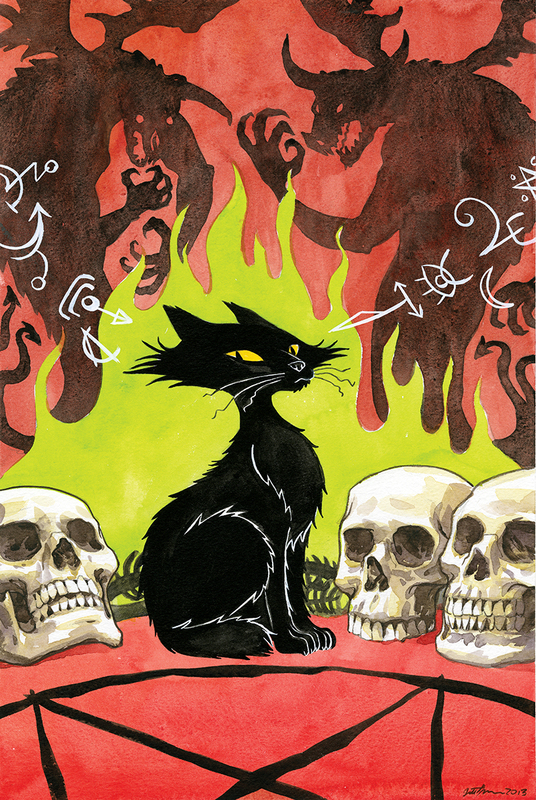 In a continued run of happy comics news, a series I'm a big fan of is returning for a one-shot this May: Beasts of Burden, by Jill Thompson and Evan Dorkin. Revolving around a group of dogs who attempt to patrol and investigate the curious number of paranormal going ons in their neigbourhood of Burden Hill, the comic began life in 2003 with a short story in The Dark Horse Book of Hauntings. Three more stories appeared in various Dark Horse anthologies in 2004, '05, and '06, leading to a clutch of Eisner awards, and the title being given its own 4-issue mini-series in 2009. All eight outings were subsequently collected in a hardback collection the following year, Beasts of Burden: Animal Rites. It was this lovely book -beautifully designed, and printed at an A4 size which really lets Thompson's watercolours breathe- I came across whilst working in my first public library job. One of the first areas I explored was the small comics section; working my way through anything that looked interesting on my half-hour lunchbreak. It was case of instant immersion, combined with the feeling of discovering a book so good of which you previously knew nothing about. I often see Beasts of Burden described, somewhat lazily, as 'Scooby-Doo but all the characters are animals!' when it's quite far from that (even without taking into account that Scooby-Doo fundamentally was about people always being behind the seemingly supernatural mysteries the gang were looking into- the supernatural didn't exist)- more horror-leaning: if it's going to be compared to a TV show, tonally, it's actually more like Buffy the Vampire Slayer. It spins the lore of a cabal of 'wise dogs' throughout history fighting malevolent forces, and there being hotspots of spooky activity -of which Burden Hill is one. Some of these dogs have special abilities that are difficult to define: a second sight, while others act as leaders, or simply defenders. Although balanced out by turns of humour and mischief, it's darker overall, with the animals suffering from trauma and abuse, but finding a sense of community and purpose in one another. The strength of writing and characterisation is what ensures these shifts and emotions work. 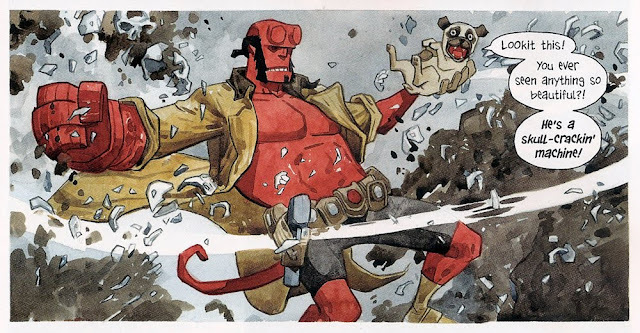 Post the hardback collection, Beasts of Burden returned for a crossover one-shot which saw the team partner up with none other than Hellboy, with surprisingly enjoyable results for something so random-sounding. A number of stories have since followed in Dark Horse Presents, with the comic last publishing another one-shot, Hunterers and Gatherers, in 2014. There's not a lot of it, which should make it easier to track down what there is, for anyone interested. That also makes this new story very welcome. Titled What the Cat Dragged In, it's due in stores on May 4th: 'When curiosity gets the best of Burden Hill’s cats (and one reluctant raccoon), sleeping demons are awakened and black magic is unleashed on the town of Burden Hill.' As a stand-alone story, I'd imagine it's well-placed to attract new readers, too.